Most people remember the lead singers who stand center stage, and many remember the guitarists and bassists who share the spotlight. But rarely recalled are the men and women wielding the sticks, obscured by cymbals and snares. This quiz deck will test your knowledge of legendary drummers from across the United States and the United Kingdom—musicians whose place in rock ’n’ roll history isn’t quite as well known as their bandmates’. 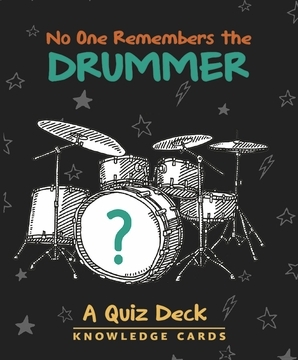 With questions listed on the card fronts and concise bios and interesting facts about the percussionists on the backs, No One Remembers the Drummer will entertain the solitary reader or give rise to a raucous multiplayer game.